I need you to cast your mind back to the last time you stayed in a great hotel . Remember that feeling when you opened the door? You dropped your bags, jumped on the plump cushions on the perfectly made bed. You peaked inside the bathroom and gave it a secret rating before popping that complimentary chocolate in your mouth and assessing (but not yet disturbing) the contents of the mini bar. Some people tell me they’re not fussed about fancy hotels - it’s just somewhere to sleep. I don’t get that. In fact I’d go as far as to say as those people don’t look after other people as much as I do. Because if they did, they would totally appreciate the absolute bliss of feeling like someone is looking after them. If you’re with me on this one, you probably do this at home too. You light candles when you’re expecting guests. You make sure there are clean sheets on the spare bed, fresh towels in the bathroom. You might even splash out on an extra bunch of Tesco’s finest flowers to make the place feel special for your visitors. Well listen up, Buttercup. Why don’t YOU deserve the five star service? Hmmm? … Newsflash - YOU DO. Part of my brief for our master bedroom renovation was to give it that hotel wow factor. I worked out that, essentially, that meant less clutter, well considered lighting, statement art …but most of all, a bed that feels luxurious and makes us feel looked after. Now I have been planning this blog post for a while now. I am completely, 100% passionate about the need to give your home that five star factor and become a sanctuary in which you can escape. Otherwise, isn’t interior design just about making it look pretty? I’m sure there’s more to it than that. Life is stressful (well ours is anyway) and it’s important that when you come home you feel relaxed and re-energised. I’ve read a lot about this in books about Self Care too. My favourite being Self Care for the Real World, in which writers Nadia Narain and Katia Narain Phillips encourage us to try and find the budget for a few things in the home that give you that looked after feeling. These are things you can treat yourself to occasionally (flowers, candles) or things you should invest in over time. So here’s how I tackled the bed situation, hoping that if i got that bit right, then the chances are, we’d start our busy day on the right foot and end it in a good way too. Obviously a decent bed is crucial to this. We bought our Darcy bed from Loaf a few years’ ago and invested in a great mattress at the same time. Loaf don’t offer a zillion choices of mattress. They offer five really bloody good ones that make it easy for you to decide which to buy. Ours has been a gradual room upgrade and after complaining of being both too hot and too cold in recent months, I decided this year I would splash out on a wool duvet. 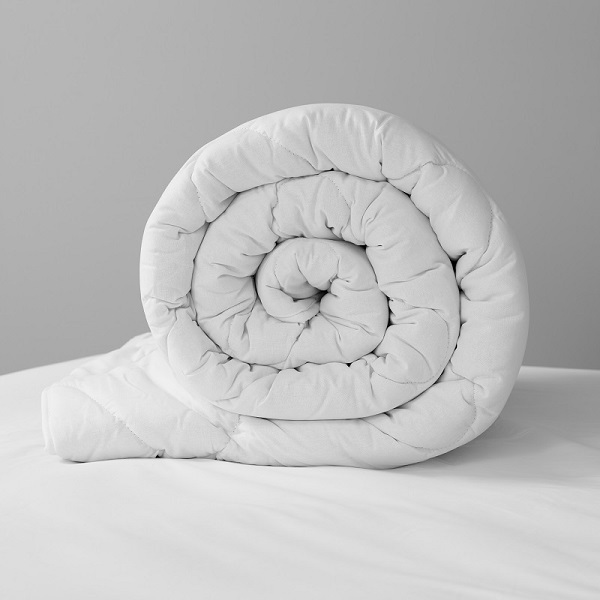 Now if you’re after a big, squidgy duvet that weighs equivalent to a small car, then wool is not for you. It’s thin and it sits flat on the bed to the point that you could possibly iron on it. But the thing about wool is that it keeps you warm in winter and cool in summer. And if you don’t believe me, ask the sheep. Dressing my bed has become a bit of an obsession. I purposely went for a neutral colour scheme on the walls so that I could play about with a riot of colours in the room. In summer I was all about the bright blue florals but now the nights have drawn in and we rarely see the room in daylight, I’ve heaped on the jewel tones. House Babylon knows all about the importance of bringing that hotel feeling home. Its 100% Egyptian cotton bed sets are available in 300 or 600 thread count (the number of threads per square inch of fabric in case you are interested). There are only two designs to choose from because - well you don’t find patterned duvets in hotels, do you? The Classic and Excellence collections both feature a classic cotton stripe and the super luxe Cairo collection is your five star plain white option featuring swanky contrast edging. 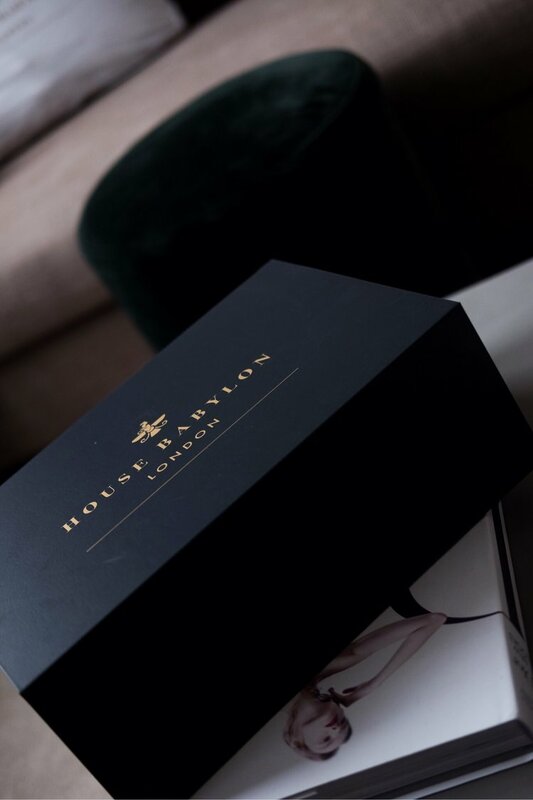 House Babylon kindly gifted my my choice of bedding and - like the hot night porter delivering that nifty little toothpaste set that you forgot to pack - it was a total treat when it dropped on my doorstep. So here’s my new bedroom all un-wrapped and ready for … er … well just for an average wet Wednesday actually. I mean, why wait for the weekend for a hotel stay when you can check in whenever the hell you like? Yeah there’ll be a wake-up call and I’m afraid breakfast is self service, but just for a minute, when I open my eyes in the morning, after a deep and restful sleep, I can pull those luxury cotton sheets tight around me and feel just a a little bit more VIP. Happy mini break at home everyone. Room service is on me. You know it already. House Candy can be anything from a beautiful vintage vase that cost peanuts in a charity shop, to a designer chandelier that swallowed a month's salary. But can it really be something as simple as a stool? The luxurious Lune V stool and a charity shop upcycled bureau. "The signature item is a gift that a woman gives herself depending on her age, her taste and the size of her purse. It is a symbol of independence and freedom, which states, "I bought this for myself, I earned it and it makes me happy." P.31 How to be Parisian Wherever you Are. The Lune V Stool by Portugese furniture brand Duistt and supplied by Open Plan Living makes me very happy. Nothing could qualify as a greater signature piece based on the above definition because (sorry boys) this one is ALL about me. I secretly saved up the pennies from my sideline copywriting job for this, my first bespoke piece of furniture that wasn't upcycled, and delighted in choosing the exact shade of luxury pink velvet and brushed brass finish. When it's a junk shop find: "What do I want that piece of old crap in my house for?" When it's a designer gem such as this (and especially if one resides in Yorkshire): "Ow much?" But if we fill our home only with items that avoid heated debate (or indeed a full on row), interior design wouldn't be nearly as much fun, would it? Seriously though, even I had some soul searching to do for this one. A sofa maybe, the iconic Egg chair I've been yearning for my entire adult life or a set of vintage Wishbone chairs, these items of course I would happily save up all my wages for. But a stool? FFS. Here's a close up of it in hot pink (the colour of my cheeks when I was forced to divulge the price to the House Candy husband). There are lots of people who wouldn't flinch at spending big on something as small as a signature stool and plenty of interior designers reading this who will have no problem justifying its price tag to discerning clients who demand the highest levels of quality and craftsmanship. Open Plan Living works with a wealth of clients for whom only the very best will do and prides itself on delivering supreme customer service. But the firm also works with the likes of you and I, who have a much more realistic budget to stick to and yet understand how one or two high end details can transform the whole look of a scheme. For me, this way more European attitude to interior design exemplifies the beauty of the signature stool. My house if FULL of junk shop finds that cost peanuts. I wasn't always forced to buy cheap (and in many cases my husband would prefer it if I didn't) but I love their unique-ness and the character they bring to my interior mix. However, I am careful not to overdo it. Overdone anything is a bad thing and - just as I love a vintage dress but wouldn't go head to toe vintage - I was conscious my home was becoming too much like a vintage stage set. It needed some added luxe to get the balance back. The wonderful buzz you get from buying a designer item comes from knowing you've worked hard for it and in my experience, the designer item is likely to work equally hard for you. This is because you are keen to ensure it is worth its price tag. I've come to the conclusion that this pretty pink perch is actually the supermodel of stools. It has the power to make anything look good and can therefore justify its high wages. In all of the images above, the Lune V stool is teamed with charity shop finds which, you have to agree, notch up a style level once they've acquired some designer luxe. This mix and match approach to decorating means that you can afford to splash out on a seemingly ridiculous signature pieces from time to time because you've saved money elsewhere in the budget by buying second hand. It's the eclectic way and the Parisian way. And whilst it might not be everyone's way, it's most definitely the House Candy way. Have you got any signature House Candy? Designer or charity shop? I'd love to know what you think to mine. Please drop me a line in the comments section. Happy weekend all. Why not treat yourself to a little luxury just for you, even if it's a £5 coffee at a coffee shop instead of the mediocre instant brew you'll make at home. Like I've told you before, you're worth it. A well styled coffee table can be a game changer. I recently took delivery of the Athena* coffee table from Swoon Editions which, let's face it, doesn't need much help to look its best. What with its white circular marble top and modernist black metal legs, Athena has got all its beauty bases covered. But not all coffee tables are this blessed. In fact, until now I've mostly got mine from charity shops and flea markets and they have required a little more help in the looks department. Over the years I've learnt to employ a couple of basic styling techniques which can really up the ante of a coffee table. With these inexpensive style tools in your accessories arsenal, you'll have everything you need to take a coffee table from functional to fabulous - whether its a Swoon Editions stunner, or a junk store gem. Today I noticed the flowers were on their way out. I always spare a few quid for supermarket flowers with each weekly shop, but they have to work hard for their dollar. They may start off as a lush full bunch in a nice vase (you know my faves if you follow my Instagram account; the pink bubble glass one, the fake Zambesi one)... but as the week wears on and things start to droop a little, the flowers get split up and chopped down. Here's where having a couple of smaller vintage vases comes in useful. You can cut the stems short and let whatever is left of the blooms have one last hurrah. You get at least another couple of days out of your flowers and a fresh new look for your coffee table. I also have a ton of cheap-as-chips stem vases in my flower vessel armoury. Many are old glass bottles with pretty decorative patterns, which I often team with a smaller vase, but can be simply lovely all on their own. We know books aren't just for reading don't we? I mean, enjoy them by all means, but just promise not to let the fun end with the afterword. After they've enriched your soul, it's time for them to enrich your coffee table. Even just a couple of books to stack on top of one another is a way cooler way of displaying flowers, an ornament, or a candle even, than just plonking that item on the table itself. Honestly, once you're into this vibe, stuff placed directly onto a table top will really start to bug you. You'll need all shapes and sizes of books to fulfil your different stacking and styling needs. Strip them of their paper cover if it's a bit naff and get down to the naked spine. Battered vintage books are a great look of course, but I tend to use whatever is lying around. Too many times we've lost a school library book, only for it to be found under a vase of freesias a week and a book fine later. Your coffee table will thank you for this small book of photographs by Martin Parr, which is just brilliant with our without the addition of flowers. The one thing you DON'T want on your coffee table is a mug stain. But truth be told, I'm not a huge fan of coasters either. In fact I'm a bit of a coaster snob. I have vintage silver ones that come in their own little stacking holder. They're always knocking about in charity shops and flea markets and they do the practical/ pretty job really quite well. So what's on your coffee table? A half eaten Snickers, last season's Next catalogue and a broken phone charger? Maybe it's time you got your kit together? Let me know your thoughts. 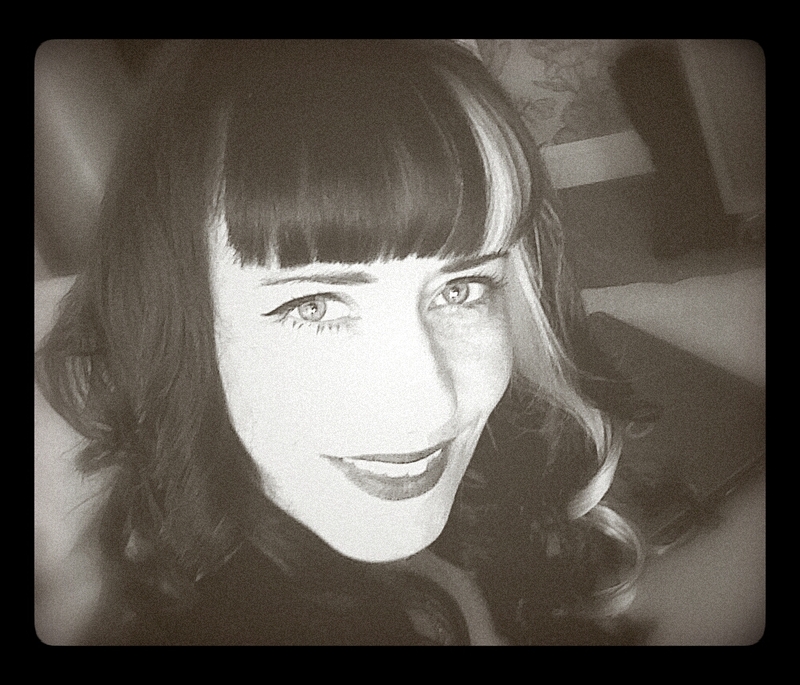 Throwback to when I was a 1920s flapper girl and I was perched on a stool at my dressing table whilst the maid adjusted the head dress around my chic jaw length bob. It happened in a former life, I swear. Only the stool wasn't anywhere near as beautiful as the Lune V stool by Portugese furniture specialists Open Plan Living. Let's just take a moment shall we? Can a stool of all things really evoke such feeling in an otherwise emotionally stable woman? And why? It's pink* and the more I think about it, the pinker I become. It's brassy; I'm a Northern lass. Same. It's all worked out. This stool was actually made for me and therefore something must be done to acquire it within this actual lifetime. Work you say? Good point. I'll get back to it. Enjoy the House Candy Hot Flush though, won't you? I'm confident there's more where this flash feature came from. Please get in touch if you've got some House Candy for me to ogle at. Any distractions from the day job always welcome. The Candy Files - Slogan or Slo-gone? Let's be frank, overtly smug messaging on homewares can grate a little, but overall, I'm a fan. In fact, my latest attempt to wear my heart on my cushion has transformed my very grown up sofa situ into something a little more light hearted. "Good Vibes" - So chilled, so roll-with-it, so Urban Outfitters as it happens; a brand which I've never known to be anything other than thoroughly on-trend. So it stunned me slightly to find that this month Elle Decoration declared the war with words officially over via its style barometer. Don't get me wrong, I totally would if I could. Fact is, the dimples may detract from the sentiment and I hate for a pertinent message to um, sag. Don't you? Keep spreading the word people. Whatever medium you choose, say it loud, say it proud and (for max respect), say it stylishly. Please share this post if you too are a bit gobby in your gaff. There's a little bit of punk and a little bit of Pollock in my latest vintage upcycle. There's also a hint of my son's reception class art apron when it came home for its first term's wash. The vibrant, paint splattered pattern of Earthed Fabric's Osmosis print is my favourite of the nature inspired Upperlands collection, mainly because it has unexpectedly pulled my eclectic interior decor scheme together. I needed a fabric to work hard for the sixties dining chairs that came to me en-route to the skip (above). They're not classics, but have sleek modernist shape. They are also light and amazingly comfy - perfect for moving from room to room as the need for extra seating is required. But choosing a fabric was proving difficult as I searched for a colour that would work in different rooms and for various situations. Osmosis in Self Heal combines splashes of my favourite brights, yet combines sweeter blush tones on a rich purple background. It makes for a riotous mix, designed to invoke positivity, passion and wellbeing. So far (and they only arrived on Monday) those qualities have rocked my white dining room, complimented bold accent colours in my kitchen and nurtured a hip, artistic vibe throughout my whole interior aesthetic. The vintage chairs that had to work hard AND look nice! For a pair of chairs that were heading for landfil, that makes for one impressive comeback. They not only look good, but the luxury Irish linen gives them a high quality, individual finish that feels super expensive and translates easily from a laid back to a formal setting. Bolster cushions made from Osmosis in Self Heal by Earthed Fabrics. What do you think to my latest upholstery updates? Do you love pattern or shy away from prints? Are you good at sticking to one colour scheme or have things gone a bit, um, artistic of late? I would love to know your thoughts, please drop me a line in the comments section, it would be so cool to connect. "Oh Henry isn't it horrid when you're hot and in a hurry and you have to hold your hat on with your hand." You better get practicing your aitches because there's a hot new homewares range to get your hands on thanks to Henry Holland's latest hook up with Habitat. If the ads for the latest House of Holland x Habitat collection are anything to go by, Henry is the burst of vibrant energy we all need in our lives on a wet and windy Monday. Thankfully he seems to have translated his sense of fun and adventure into a bright, summer homewares collection that has the power to instantly lift your interior mood, whatever the weather. Funky florals fire up the tempo of kitsch black and white gingham in a banging range inspired by the colourful world of Romany travellers. Beautiful bedding will instantly update a room in the same way that a high street fashion splurge can have you feeling fresh and young again. There's a matching rug that can't fail to fire up any failing floor situation and who doesn't love a statement cushion for a cheap and cheery transformation? But there's one piece from the collection that I think is less of a seasonal pick-me-up and more of a future classic. Henry has waved his happy wand over Habitat's Misty armchair and it is now available in limited edition hot pink velvet with contrast navy blue piping. Misty's splayed black legs and curvaceous seat give it mid century class, whilst the navy piping curbs just enough of the hot pink girliness to give it rock star edge. As you will know from my Instagram feed (and click HERE if you don't) I'm a huge fan of bright neon colour pops however traditional the contrast may be. Brights are a basic for me. I need them to supercharge the atmosphere with fun and happiness and if I'm bored with how a room looks, the first thing I do is add a Splat or a Zing or a Let's-'Ave-It of bright banging colour. If I'm in need of a super quick fix, a bunch of neon pink roses usually does the trick, but for long term perkiness, this eye poppingly perfect statement chair is hard to beat. You can try before you buy by visiting the ingenious Henry Holland x Habitat suite at The Hoxton which is decked out in full on triple H happy vibes. But HURRY, it's only on until the end of March, which means there really is only one word to finish off this post. I'm in limbo. I hate my poky entrance hallway (again) and yet I've been told it's likely to be next year until the builders can fit me in for my big renovation plan. I need a cheap solution to perk things up and see me through just one more summer. It's a big ask for a small carpet and yet I've convinced myself that a super colourful hall runner is the answer to my prayers. As this is a temporary measure, I'm on a particularly tight budget. In fact, it needs to cost less than the pair of blush pink leather brogues I've been eyeing up to bridge that other annoying time lapse until the warmer weather arrives. I know, I know and thank you for your concern. It's a sad day when a woman must forfeit her footwear for her floor. But sometimes we homeowners have to take one for the team, don't we? Unless of course, we can find exactly what we are looking for, for such an bargainous sum that there are still plenty of pennies left in the shoe fund. Now that would be clever. This Stina floral runner is a measley £31.50 now that Urban Outfitters have been kind enough to slash the price. Faded out florals give it a lovely vintagey look that is so feminine it might just detract from the aroma of sweaty trainers wafting from the shoe cupboard. It is lightweight and cotton which means I'll chance it on a cool wash once in a while and ... wait a second... blow me if it doesn't go perfectly with those blush pink brogues. 'Cos we all match our shoes to our hall runners, right? In my book there's nothing like a dash of pink to pretty things up a little. Call back soon to see if it does the trick. Happy Monday all. If I can help perk up your week and address any niggly interior woes, please drop me a line in the comments section. I would love to hear from you. I haven't experienced WAG envy on this scale since Victoria Beckham's Team Baden-Baden taught the world a lesson in girl squad manners back in 2006. Michelle Keegan's portrayal of Tina Moore (wife of World Cup '66 hero Bobby) in the ITV series Tina and Bobby has stirred something inside. Not just Inside my heart, not even limited to inside my wardrobe, but inside my entire home. I want a bit of that late sixties/early seventies WAG (SWAG as it now needs to be known) at House Candy HQ and I'm turning to the celebrated retro-glam interior designer David Hicks for inspo. Contrasting textures define Hicks' style, with deep shag pile carpets balancing out the shiny surfaces and angular shapes of furniture typical of this era. Orangey browns and rusty red leathers that remind me (in a good way) of Starsky and Hutch are punctuated with pops of glossy turquoise. Leafy house plants, low hung, slightly random wall art and patterned curtains rock a retro vibe that my sources tell me is set to make a significant comeback this year. And it is this kind of SWAG - a retro & therefore infinitely cooler version of today's luxed up footballer's wife style, that we were invited to swoon over in Tina and Bobby. In particular, it was their last marital home, the dream 70s open plan new build that made me long for life back when there were only 3 TV channels, telephones were attached to curly wires and it was the done thing to barbeque in 6 inch platform knee boots. I'm thinking of putting the flooring up the wall when/if the kitchen extension ever happens (unlike Tina and Bobby, we're having to save up see). The ceilings will be lower there and the modern contrast will create a cool kind of cosiness in an otherwise featureless new-build area. I've been hunting for the perfect low, boxy sofa for some time and having failed to find it, I've decided instead to get my 11 year old Habitat Sydney sofa recovered in velvet and add some contrast piping. Tina and Bobby had a similar look in the TV series, complete with fringing which I'm also absolutely mad for, but am saving for another project. See below. I fancy a day bed. Welllllll, it's the perfect place for a SWAG to get her pedicure done and with this fringing no one will ever know that I'm way too posh to hoover under the furniture. OK so this probably won't happen, but I SO like the idea of decanting my M&S ready meals in the privacy of the kitchen then serving them to an adoring dinner party without them ever needing to know the secret behind my Chicken Chasseur. If Flos IC lighting were a celebrity, I'd be its stalker. Ball shaped pendant lights were big in the 70s but can somebody tell me in what era these simple, elegant yet not at all ostentatious beauties would look out of place, because I can't think of any. Here Flos look stunning in a period panelled setting, an image I've been staring at for far too long already today. These babies are earmarked for my hallway and that's a fact. So Tina, you can keep the diamond rings. I'm not fussed for the fancy cars and as for the wealthy, good looking football hero of a husband... pah! what a let down he turned out to be. But I do like your retro WAGishness lady. I love your bo-ho dresses and since adopting your beehive, my fine hair has a whole new lease of life. I love your SWAG Tina Moore (or at least I love Michelle Keegan's version of your SWAG) And I'd LOVE for you to bob round to my place for Babychams so we can talk the Dralon and tassles off each other. Unless stated, images are pinched from Pinterest where incidentally I'm collecting 70s interiors images like WAGS collect collagen. Follow me here for inspo. I was having a peacock week last week. First it was the theme of a few random flea market finds and then this image leapt out at me on Instagram. Peacocks are natures' most notorious show offs, which makes them the perfect emblem for Coventry based designer and maker Jo Goodman to woo us with, in this, the first interview for my new Candy Floss feature. Here I aim to bring you the insider goss (Candy Floss = Goss in my own personal rhyming slang btw) from some of the most exciting designers, makers and brands that are currently catching my eye. I'm a sucker for vintage fabrics, but whenever I've tried to incorporate them into soft furnishings, it's all gone a bit Cath Kidston - not necessarily a bad thing, but not nearly as edgy as I'd like. Jo manages to strike an altogether more modern chord with MayRose Vintage. Her unique collection of handmade cushions and lampshades marry Gothic, Victorian and Retro influences to ensure a seriously cool departure from traditional shabby chic. Like Cath Kidston however, there's a strong identity to Jo's brand and it's one she is passionate about developing. To this aim she trawls the internet and second hand markets for the perfect fabrics to convey the MayRose Vintage message - a look she describes as "dark style with a hint of kitsch and a splash of opulence. Working from home part-time means Jo can surround herself with her most treasured items and feel totally engrossed in her work. This may be a one off commission or a new sample design to try out on her avid Instagram followers. There is a downside to working from home however and that's the issue of storage. "Lampshades are not the easiest to store!`" says Jo, "I tend to make a sample & then make them to order." Six months ago Jo took the plunge and reduced her hours at work so that she could concentrate more on her business. It was a daunting prospect, but one that thankfully has paid off in a relatively short space of time. Customers from as far afield as Australia have been in contact and it's the buzz of positive feedback that keeps Jo going when the going gets tough. "I love that my products appeal to a particular kind of buyer - people who are looking for individuality and want to make a statement in their home but also have a genuine appreciation of homemade goods, and share my love of interior design" said Jo. To say that Jo has a vision is a bit of an understatement. She is due to get married in September and plans to do all the flowers & decorations herself so that the whole event has the Mayrose Vintage stamp on it. It's this passionate identity that makes Jo's designs stand out in an incredibly tough marketplace and for me, gives MayRose Vintage a kind of sophistocated sass you'd expect from established high end brands such as House Of Hackney. But the big difference is the price point. 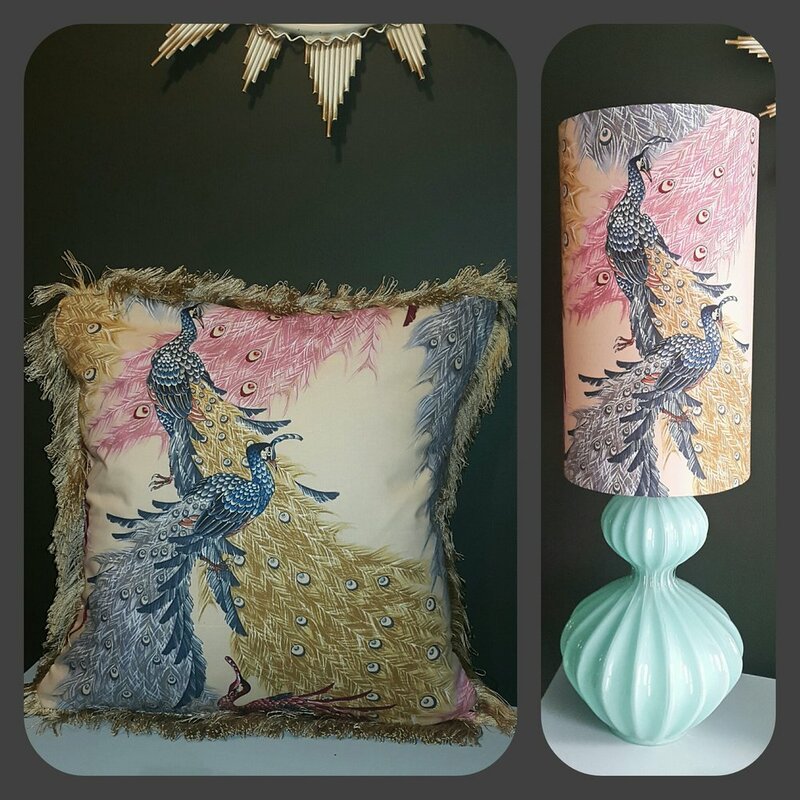 Cushions start from as little as £20 and lampshades at around £35. Jo is a self confessed cushion obsessive (she likes to see at least 5 or 6 on a bed) and at these prices, fellow cushion lovers can afford to become collectors. 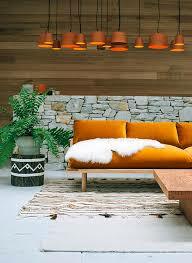 "Cushions are the easiest way to re-dress a room," Jo points out. And I don't know about you, but I can certainly feel a Spring re-dress coming on. So apart from gaining a husband, two children and a new cockapoo puppy this year (Polly Jean is named after PJ Harvey which makes her cute and cool and therefore totally on-brand) what does the future hold for MayRose Vintage? Expansion of course! "Etsy is great for attracting overseas buyers, but little known in the UK," said Jo. "I'd like to expand my range and sell in independent interiors shops which would provide greater opportunities to meet my customers - their feedback is crucial in helping me develop the brand." Only four years ago, Jo was making vintage assemlage jewellery as a hobby and having lost heart with it, tried out a few cushion covers for a change. Today she is carving out a name for herself in the world of interior design and looking to spread her wings - and her peacock feathers - in the industry she loves. Find MayRose Vintage products on Etsy or follow Jo on Instagram to keep up to date with all the latest designs and product releases. Want to be featured on Candy Floss and spread the goss on your brand? I'm all eyes and ears (and ok a bit sweaty palms) so please do get in touch by clicking on one of the social icons down the side and shooting me a message.